The definition of private and hybrid cloud has become increasingly muddied over the years, but this year's Modern Infrastructure Impact Awards winner can help IT professionals understand what a true private cloud should be. In short, CloudBolt's software helps enterprise IT shops operate like a cloud service provider. Many competing private and hybrid cloud products offer only a piece of the cloud pie, but managing multiple tools can create new challenges for IT administrators who were hoping a private cloud would help ease management. One Modern Infrasturcture reader and CloudBolt user put it perfectly, saying "I use multiple clouds, and CloudBolt makes it easy for me to choose the right tool for each job. I don't have to switch back and forth between each vendor's interface. I just log into CloudBolt for a single place to manage all my environments." Judges said CloudBolt's software "takes all the features enterprises are looking for and puts them into a single intuitive interface that enables IT to react to business needs." Among the most important factors that led judges to select CloudBolt was its compatibility with products from a wide range of hardware and software vendors. The vendor-agnostic product can be deployed as part of a new private cloud build or can be easily integrated into an existing infrastructure. CloudBolt's software offered the most comprehensive feature set of the nominated products, with customizable dashboards, reporting and automation control, readers said, as well as a user-friendly interface and ease of use. 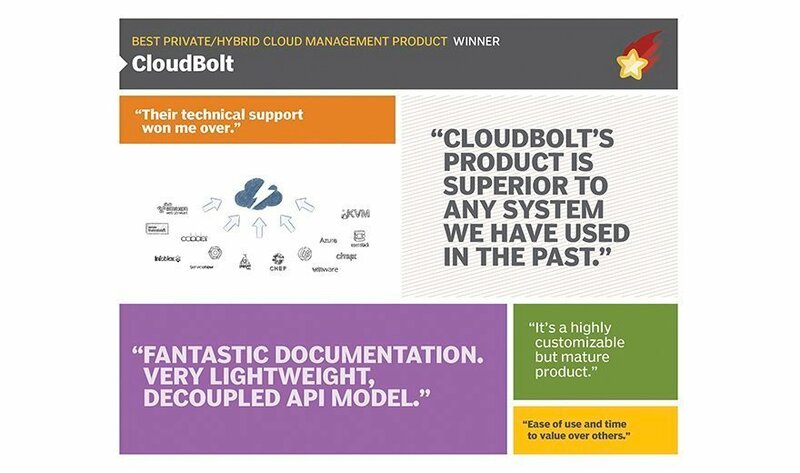 "CloudBolt installed in our environment in an incredibly short period of time (i.e. less than an hour) and did an extremely comprehensive import of our environment," one reader wrote. "We literally turned our existing infrastructure into an Amazon-like cloud in a matter of minutes. If I had not seen it with my own eyes, I would not have believed it." Do you run a private, hybrid, public or multi-cloud infrastructure? We actually run all four, depending on the needs of the project.